The Irish whiskey or Uisce Beatha Eireannach in Gaelic, traditionally is distilled three times –two are also allowed-in the Island of Ireland, including North Ireland, coming from a mix of malted and unmalted barley with or without adding whole grains of other cereals. The maturing whiskey is stored for a minimum of three years in large, dark, and aromatic warehouses on the island of Ireland. The whiskey is contained in wooden casks, such as oak which may have been previously used to store other alcoholic beverages, for example Madeira, Sherry, Port or Bourbon. This type of whiskey is famous for having a light and silky mouth feeling, with a great complexity of aroma, mellow and fine flavours. 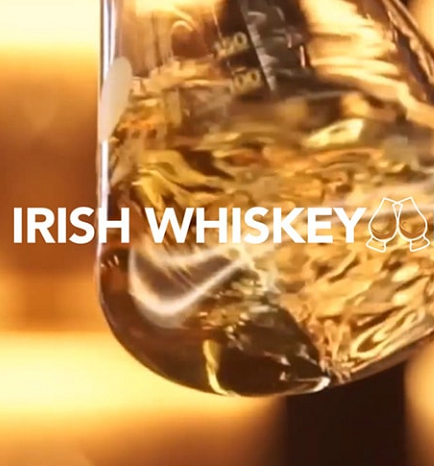 The general classification “Irish Whiskey/Uisce Beatha Eireannach /Irish Whisky” also contains three varieties, “Pot Still Irish Whiskey”, “Malt Irish Whiskey” and “Grain Irish Whiskey” which can also be combined to form a “Blended Irish Whiskey/Irish Blended Whiskey”.